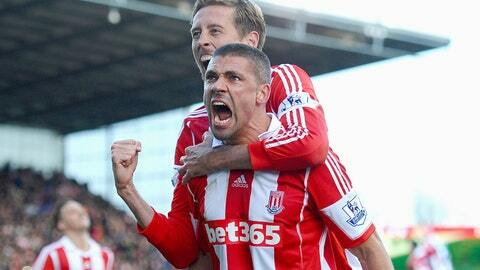 Jonathan Walters of Stoke City celebrates his goal with Peter Crouch. Arsenal lost ground in the Premier League title race as Jon Walters’ 76th-minute penalty gave hosts Stoke a 1-0 win on Saturday. With Chelsea winning 3-1 at Fulham, the Gunners are now four points behind their London rivals at the top of the table with 10 rounds remaining this season. The victory saw Mark Hughes’ Potters side hit the 30-point mark and they are now 12th, six points above the drop zone. Glenn Whelan forced a fine save from Wojciech Szczesny at the end of what was otherwise a dull first half. The second period was hardly full of incident either, until Walters toed the ball skywards on the edge of the area and Laurent Koscielny handled. Referee Mike Jones pointed to the spot and Walters sent Szczesny the wrong way. Arsene Wenger had introduced Mesut Ozil shortly before the penalty, and the club’s record signing went close with a shot across the face of goal. Another substitute, Yaya Sanogo, then wasted a gilt-edged chance to equalize in the closing stages as the Gunners went down to their fifth league defeat of the campaign. Arsenal had Kieran Gibbs back in their first XI and record signing Ozil on the bench. Fit-again Gibbs replacing the injured Nacho Monreal in defense was the only change to the starting line-up from last Saturday’s 4-1 win against Sunderland, while playmaker Ozil was returning to the matchday squad after missing that game due to injury. Thomas Vermaelen, back involved after an extended spell on the sidelines, was also among the substitutes. There was only one adjustment to the Potters team as well a week on from the 1-0 loss at Manchester City, with the injured Peter Odemwingie dropping out and Steven Nzonzi coming in. After a uneventful opening quarter of an hour, Stoke were unfortunate to see the offside flag raised against them. Marko Arnautovic delivered a deep cross from the right and Walters headed the ball down towards goal, although it bounced just wide of the post. Replays showed Walters was just about level, however. Peter Crouch hit a shot into the side netting from a very tight angle shortly after the half-hour mark, after Nzonzi had looped a short cross into the box from the right. Arsenal responded with Mikel Arteta finding Lukas Podolski running down the left channel, the Germany international then blasting a left-footed shot towards goal after getting into the area – but he failed to hit the target. The best chance of the first half came with three minutes left before the interval. A beautiful pass from Ryan Shawcross out wide to the left began the build-up, then Arnautovic spotted Whelan’s run. The Republic of Ireland midfielder let fly with a shot from long range and Szczesny had to dive to his left to make the save. Erik Pieters was booked for a foul on Giroud at the end of the first half, and the second period began with Nzonzi’s tame header going wide. Crouch failed to make the most of good openings on two occasions before Koscielny committed his handball offense in the 76th minute. Alex Oxlade-Chamberlain impressed from the bench as Wenger’s side looked for a route back to parity, but Stoke held on for the three points.